RoadKill T-Shirts sent me this funny t-shirt for review. The company sells all sorts of t-shirts with funny sayings on them. The shirt is great quality and it fits very well. 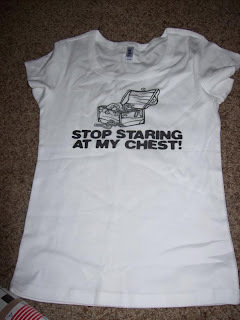 This is one of those shirts that I will not be wearing in public though. I don't want to attract that kind of attention lol. The shirts start at $14.99 and are buy 3 get three FREE right now! Thanks for the funny tee!